Today our pilots, Troy and Derek, gave us the all clear to fly and begin our experiment for real, setting out the corner reflectors and transect lines. So, after a last check on the weather, we loaded up the Twin Otter and were airborne by about 9.00. Due to the early start I managed to sleep all the way there and woke up when I felt the plane losing altitude. 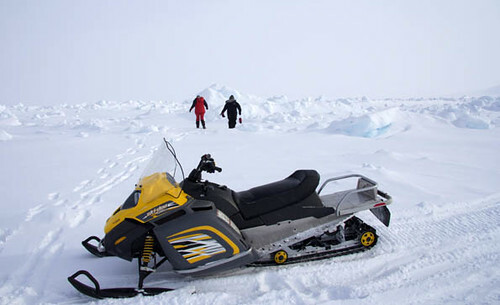 Troy and Derek were circling around the ice looking for a safe place to land, where the ice was thick enough to support our weight without us ending up in the ocean beneath. After a few low passes, at about 15 m, to scout out a makes-shift runway, we landed pretty smoothly. After we had landed they taxied around for a bit to compress the snow and make a runway for us to take off from. This was my first ‘unseen’ (i.e. no one has ever been there before and one has to test how thick the ice is) landing on sea ice and it was pretty exciting. Our first site was at 85.6° N 69.8° W, the furthest north I have ever been and will probably ever get to. The conditions were great around –25°C and not very windy. We set up the corner reflectors and marked their locations with large coloured sheets of material and bin bags full on snow, so Henriette and the other Twin Otter could see them from the air. The photo shows one end of our site marked by an orange sheet and bin bags. The corner reflector can just be seen behind the flag, which we use to line the site up. Malcolm then used a satellite phone to call back to the base and tell the Henriette that they could leave to overfly our ground site, taking measurements with their airborne radar and laser. We also measured the ice we landed on. It was about 1.80 m thick – floating on the deep ocean waters. We then headed south again to 83.3°N 62°W to set up our second site. It was colder and windier here, but the set up went well again. We saw that the snow cover at the two sites appeared to be different. This is important for our experiment as we want to see if the radar sees through the snow the same way when the snow has different properties. We only needed about 30 m of runway to take off from the second site as we were lighter after leaving the corner reflectors on the ice and we made it back to Alert for dinner. Rosie, Seymour and I have spent the rest of the evening making sure that our ground radar is working. Malcolm has been using the data from the GPS buoys we put with the corner reflectors to track where they are moving as the ice moves. This is truly awesome stuff! Thanks a lot and keep it up.